Where to even begin with Kenna... Kenna and her family has such special place in my heart and I wish I could make her dresses forever!!! I had the pleasure of making not one, but TWO gorgeous dresses for Kenna! My team and I are so proud of these dresses and are so honored to have worked with the beautiful young woman who wore them. Thank you so much, Kenna for the honor of creating your dream dresses!!! In addition to our custom wedding dresses something we LOVE to do it recreate a mother's wedding dress for her daughter. And that's exactly what we had the pleasure of doing for Ann! Timeless. Elegant. Breathtaking. Adrienne and Eric's wedding day was gorgeous from start to finish! Adrienne's custom wedding dress is so dreamy and we had a blast creating it. April's end brought a new beginning for Liz and Brett. Surrounded by their closet friends and family, these two love birds said "I do" and started their forever! But before Liz could walk down the aisle, she needed the perfect dress! No, that's not a typo. Taylor & Taylor were married January 21st in Downtown, Tulsa at The Broadway. Taylor and Taylor met through an online dating site and quickly fell in love! Groom Taylor proposed that Bride Taylor spend the rest of her life with him and without hesitatation, she said yes! November 5, 2016, turned out to be one of the most perfect days to have a wedding. Instead of dry, freezing weather, the air was warm and the sun, bright! Stacey and Troy held their wedding at the brand new Noah's Event Venue in Tulsa, Oklahoma. Surrounded by friends and family, Stacey and Troy committed their lives to one another to become husband and wife. Allison and Danny's wedding day was a whirlwind adventure! These two lovebirds are used to thrill as they operate a successful horse racing company every weekend in Oklahoma City. They love the outdoors, adventure, and fun, so their wedding day had to equal or surpass their already exciting lives! To say Chelsea and Cory’s wedding was one-of-a-kind would be a huge understatement! 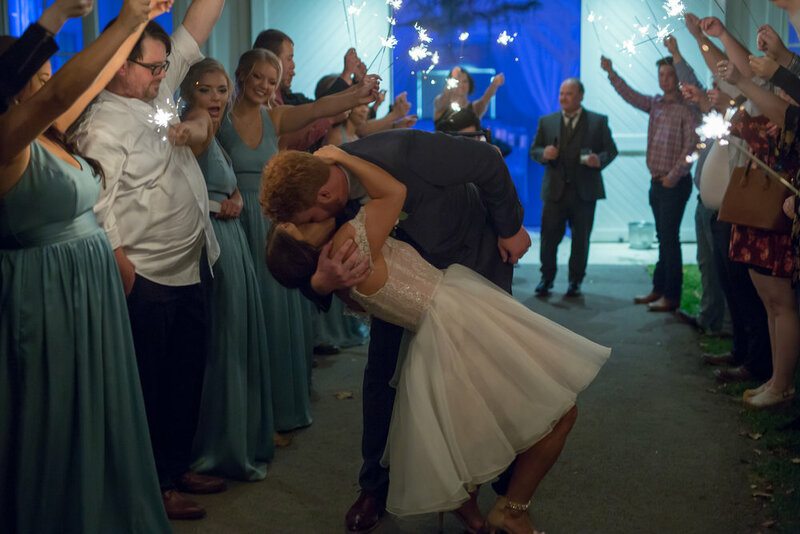 Co-Owners of their own event-planning company, Take Heart Events located here in Tulsa, they pooled their expertise, creating the perfect wedding day for each other! Summer’s end brought a new beginning for Chassi and Jake. They were blessed with a beautiful wedding venue – the Bride’s family’s property in rural Broken Arrow, Oklahoma. Lush green sprawling grounds, clear blue skies boasting just a wisp of clouds, the sound of song birds joining in chorus to welcome cherished family and friends as they witnessed the beginning of forever for these two lovers. Dayna and Jason were married September 10th, 2016 at the gorgeous Spain Ranch in Jenks, OK. Their wedding day was the epitome of elegance and class. Brian and Cassi were married June 25th, 2016 at their gorgeous family lake house. Cassi was not your traditional bride and had quite some trouble finding the right dress that would work for her. Cassi originally came to us with the hope of buying a dress off-the-rack and having us reconstruct and alter it to be what she wanted. We quickly realized that the cost to reconstruct a dress to be what she wanted would cost more than just making it from scratch! Julie's 2nd wedding was held in the beautiful country on Armenia! Julie wanted something playful for her 1st wedding in France, but wanted a more jaw-dropping, elegant look for the Armenian bash! Calleigh and Lucas have know each other most of their lives. They attended the same school, same church, and were in the same friend groups. But only until a couple years ago, could they have ever dreamed of falling in love with each other! When we first met with Julie she had only be living in America for a few months. She had traveled across the world from Perpignan, France with her Fiancé to become a part of the prestigious Tulsa Ballet Company. We had the pleasure of seeing them both preform in the production "Romeo and Juliet" and they were amazing!!! Amelia was such a joy to work with from the start! Amelia's dress journey with us began in July of 2015. Amelia wanted her dress to be simple (but not boring), classy and flowy. We knew just the right design for her! Morgan's dress journey started about 20 years ago, the day her mom got married! Fast forward about 20 years to August of 2015, when Morgan started the process of reconstructing her mom's wedding dress to wear herself! Maddie came to us January of 2015 after Casey popped the question on December 16th, 2014 at Dry Gulch USA. 10 short months later Maddie and Casey were married at the same place he proposed! Jordan and her group were a blast to work with from the start! Every fitting was filled with laughter and a bit of sarcasm. They were a breath of fresh air and I looked forward to every meeting! Our journey began January of 2015 with a clear vision. Jordan was inspired by Old Hollywood fashion and the art deco era and wanted her dress to be representative of that! Meet Gianna and Wes! These two love birds said “I do” on September 3rd, 2015 in the beautiful Kirkland Chapel at Camp Loughridge. Gianna was glowing the entire day and Wes simply couldn’t take his eyes off her! Marie came to me in the Spring of 2015 completely stressed out about her dress. She had a clear vision of what she wanted and was not finding it in the stores. One of her biggest struggles was finding the right silhouette for her unique shape.